Synopsis: High school football has returned to the Sacramento area and with that comes the ever present concerns of players’ safety surrounding the topics of concussion, dehydration, and heat stroke. 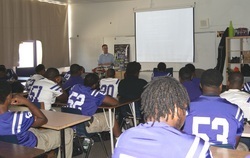 Fueled by his passion for sports and enthusiasm for working with high school athletes, Dr. Paul Dagenais (Dr. “D” for short), met with a group of football players on a local high school varsity team to talk about these very serious topics as part of his CHPT project. Dr. Dagenais had a few goals in mind including increasing awareness of what a concussion is, signs and symptoms to look for, when to see a physician, and the process of returning to activities after a concussion. Most importantly, he wanted to ensure that players wouldn’t hide concussion symptoms from coaching staff and/or medical personnel so as not to lead to long term illness such as chronic depression or chronic traumatic brain injury. Dr. D shared that he had fun and was impressed by the students’ questions and eagerness to participate. He hopes to bring this kind of interactive presentation to other area high schools as concussions are such a hot topic in the media right now. He feels that “it’s important that these athletes have the right information and are able to understand the risk of serious injury and potential long term implications”. Dr. Dagenais will continue to support this particular team from the sidelines during their season.